Do you know Tammi Sauer? Since I’m a cool member of the Oklahoma Society of Children’s Book Writers and Illustrators, I got to meet Tammi about a year ago. She’s incredible, and published, and comes to Schmoozes, and is possibly the most currently-in-demand famous person I know. Anyway, Tammi is awesome, and this month, she received the Oklahoma Book Award for her new picture book, Nugget & Fang, which I love and have already talked about on here. Here’s a picture of all the award winners for this year. She’s the cute one with dark hair in the front row. I like how she’s holding her medal with both hands. Oh, and Nugget & Fang is also a finalist for the SCBWI Crystal Kite Awards, which is also a huge deal, so good luck vibes for Tammi, please! 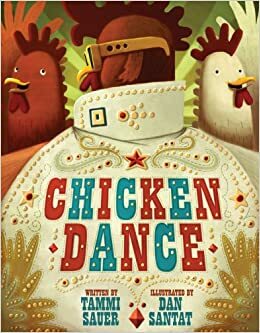 In related news, I did read Tammi’s book, Chicken Dance, this week, after seeing it mentioned on a Sequoyah Award poster at the library. Somehow I’d never read this one, even though I read the sequel, Bawk & Roll, more than a year ago. I read this one to my six-year-old today, and she immediately demanded that I “read it again!” so that’s obviously a positive review. From the book’s description on Amazon: Meet Marge and Lola, chickens on a mission: to win tickets for the Elvis Poultry Show! But their toughest competition—a pack of menacing ducks—sneers that “all a chicken can do is bawk, flap, and shake.” Can our two feisty chicks show those quackers how to rock ’n’ roll the barnyard? Tammi Sauer and Dan Santat have whipped up a giddy, goofy romp where cows fly over the moon, ducks surf in a water trough, and one very familiar-looking rooster gets all shook up! This was a really cute book. Having been a chicken and duck owner for many years, I enjoyed all the little jokes…especially when the chickens starting doing “what chickens do.” Good thing, too, since I’m sure I’ll have to read it several more times for my youngest. This is the kind of book that I don’t have a problem repeating. And repeating.